According to the Center for Disease Control one in four senior citizens falls every year. Combining water and tile or linoleum in a bathroom can create a slick surface and increase that likelihood. Aging can cause us to be weaker and more unsteady on our feet, so it’s important, to protect yourself in the bathroom. Below is a list of what we consider the best grab bars to help keep you stable and on your feet. The Sumnacon 16-Inch Bath Grab Bar with Anti-Slip Grip is an excellent basic model for anyone needing a grab bar in the shower, tub, next to the toilet or near steps. The bar screws into the wall making it sturdy and reliable but it is affordable enough it can fit into most budgets. The bar is made of stainless steel but has a textured grip to ensure your hand doesn’t slip off when it gets wet. It also comes in a 12-inch version, for bathrooms with smaller wall space. Floor-to-ceiling pole with ladder grip is durable and versatile. The Stander Security Pole and Curved Grab Bar is ideal for the shower but can be used in any area of your bathroom or home. The bar doesn’t require any drilling for installation. It uses tension mounts to secure to the ceiling and the floor. If you decide you want it to be more permanent or more secure, it does come with screw for easy installation. The bar has a pivoting curve grab bar in the middle of it that moves and locks every 45 degrees to make maneuvering around easier. You can also grab above or below the curved grab bar if you want to hold onto something that doesn’t move. 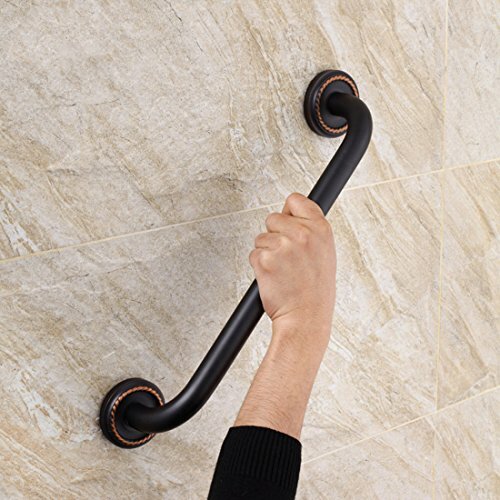 The Vive Grab Bar Suction Shower Handle is ideal for those who do not need to apply their full body weight to a bar, but just want a bit of added support. This budget-friendly shower bar attaches easily to the wall with suction cups and has an indicator color (green when secured, red when it’s not) to show you’ve suctioned it to the wall properly. We like that the curved bar has a textured grip to keep your hand from slipping and has plenty of clearance from the wall to give you enough room for your hand to wrap around it. For it to work properly, you will need a non-porous surface in the area you’re planning to install it. Shower tiles need to be at least four inches large or a flat because it won’t stick to seams or grout. The Moen LR2356DCH 16-Inch Grab Bar with Shelf doubles as a bar and a shelf which can save space in small bathrooms. The tray is removable, so it can be taken out and cleaned. This shower bar is made from stainless steel, so it won’t corrode or rust. It screws directly into the wall and can mount at any angle. The elegant finish and solid brass durability make this our favorite for a heavy-duty model. 19.5 inch bathroom anti-skid grab bar, every family essential. Safety meets sophistication with these heavy-duty grab bars. Durable solid brass construction in an old world bronze finish that creates antiqued look. 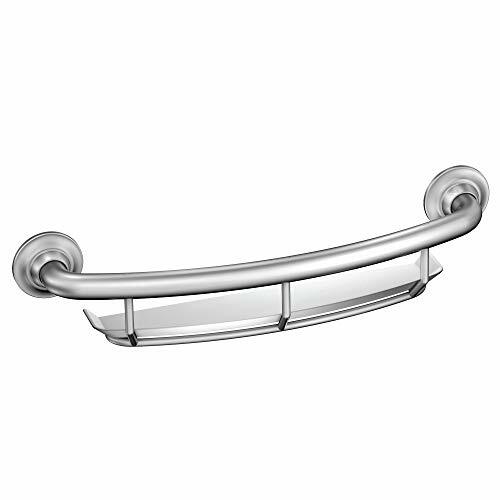 The FLG Bathroom Shower Bath Grab Bar is a good heavy duty option. It comes in an oil-rubbed bronze finish and is made of solid brass. It’s easy to install and come with covers to hide where the screw goes into the wall. It’s nearly 20 inches long and can be mounted in any direction. RUST-RESISTANT AND BUILT TO LAST! 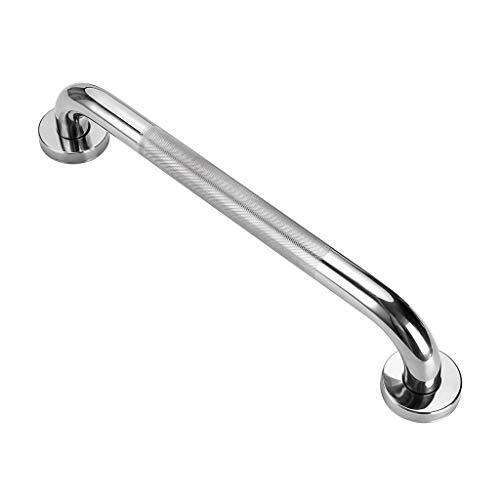 This grab bar is made of high quality chrome-plated knurled steel that helps prevent rust. LIFETIME LIMITED WARRANTY. Mounting screws and gaskets included. Textured grip for slippery showers. 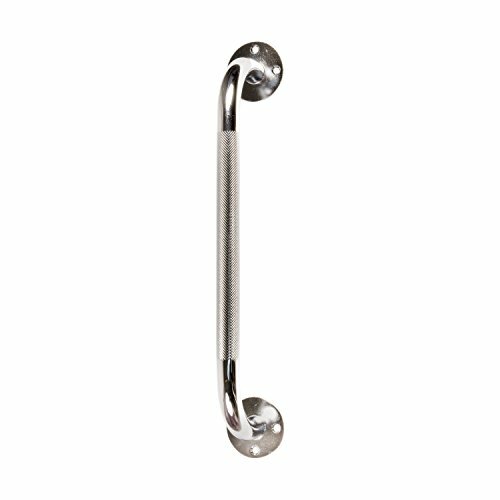 The HealthSmart Textured Steel Grab Bar for Bath and Shower is an outstanding value for a high-shine chrome finish and extremely sturdy bar. With corrosion-resistant steel construction and secure, screw-in wall mount, this is a reliable and safe shower bar. We like that it offers the highly-polished surface, yet also has added grip with a texturized central portion. It does require screws, however, if you need a shower grab bar that can handle a bit more weight, this makes for an ideal design. The extremely affordable price makes it easy to afford on anyone’s budget. This can also be used next to a commode or near stairs—anywhere a little assistance is needed. Overall, this is our favorite for a shiny, sturdy chrome shower bar. Always check bars first before putting your entire weight on them. Remember, they are for assistance, and usually not meant to hold your whole body weight for long periods of time. You’ll need to factor in a few points when purchasing your bathroom grab bar. Safety is a crucial matter when it comes to shower grips. Resting your weight on a bar can cause even more injury if it’s not installed correctly and comes loose. Beyond your budget, consider some of the following as you make your decision. Most shower bars are not meant to carry full body weight for long periods of time. They are meant for use as an aid to pull yourself up or help you sit down. They can also be used for balance and support, but not for extended periods of supporting complete body weight. All shower bars have a weight limit capacity. Check packaging to make sure the one you are considering will support you. For the most stabile support, consider a grab bar that’s mounted into the studs of your bathroom wall. 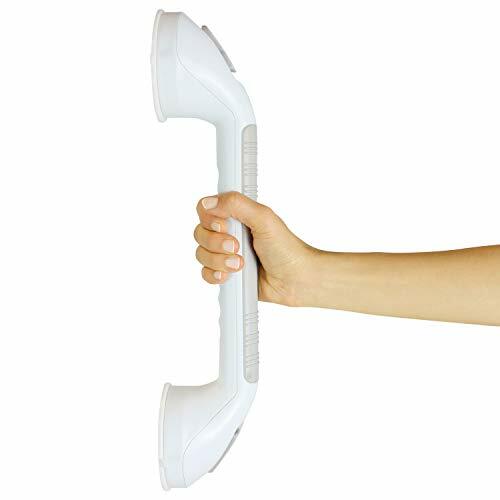 Suction cup grab bars work well for light support or travel. Most bars designed for the shower are rust and corrosion resistant. Look for shower bars made to withstand constant water and moisture. Many models these days don’t look like shower bars and can often match your other bathroom fixtures. However, if you’re still worried about the possibility of rust, or don’t like the stainless steel or aluminum options, a plastic model might be a good choice for you. Consider how important a textured grip is for you when selecting a shower grab bar. It may not seem imperative until you actually need to grab on quickly to steady yourself. If you have large hands, looking for a bar with a little extra clearance from the wall (over three inches) or a curved shape bar might be a good idea. Suction style grab bars are very convenient for ease of installation but can come loose over shorter periods of time. Moreover, they are not designed to hold as much weight as a wall mount steel bar, for example. Suction models are ideal for travel. They also work well for those individuals who will rest very little weight on the bar and just want the extra assurance getting in and out of the shower. A shower bar won’t do you much good if it isn’t installed correctly. With a suction model, you want to be sure the cups are correctly secured on a smooth, non-porous surface and not over any seams or grout. Check the suction cups often to make sure they haven’t come loose or are developing mold. With a drill and screw installation, follow the instructions and make sure you’re using the correct tools for tile, mounting them on wall studs if possible, and drilling holes to the proper size. Always give bars a “yank test” first to make sure they installed correctly and can hold your weight. Picking the right grab bar is one of the best moves you can take to make your bathroom a safer place. But there are other steps you can take to make the area safer. Consider putting down non-slip, textured stickers or mats in the bottom of your tub or shower. This will allow you to maintain your balance and make the area around your feet not as slippery. The combination of water, shampoo, conditioner or soap can create a falling hazard in the bottom of the tub. Don’t choose bath mats or rugs that move easily or roll up on the edges. This can cause you to fall even your feet are dry. Once you’ve decided that a bathroom grab bar is right for you, your budget and personal preference will be the next consideration. Whatever grab bar you choose, you want to make sure it functions in the way you need to and provides the stability and support you desire. The right choice can help you remain independent for even longer.